Our Main Hall is accessed on the south of the building, on New Road. There is a small car park by this entrance, but people hiring this hall are also able to use the Church car park on Durrington Hill. This is a good sized, versatile hall for all events up to 100 people. This hall comes with heating (October - May) and use of the kitchen. There are fourteen 6' folding tables, seven 4' folding tables and seven 3' folding tables with 80 folding chairs available for use. 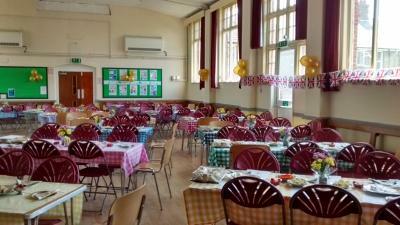 For children's parties there are six 4' children's tables with twenty four matching chairs. (If you are considering this hall for a children's party with a bouncy castle, this hall can take up to a 12' high bouncy castle. The hire fee for this hall is £25 per hour. If you are planning a large party, you may hire the adjoining Atkinson Room for an extra £10 per hour. This offer is only available when booking the main hall or Church.